According to a Gallup poll, the average full-time employee in the U.S. works 47 hours per week. Where do employees spend the majority of that time? At their workstations. What’s more, another study showed that the average employee only has 150 square feet of space to call his or her own. With space that cramped – and, let’s be honest, often uninspiring — it’s no wonder employee productivity suffers as a result. But employers take heart! 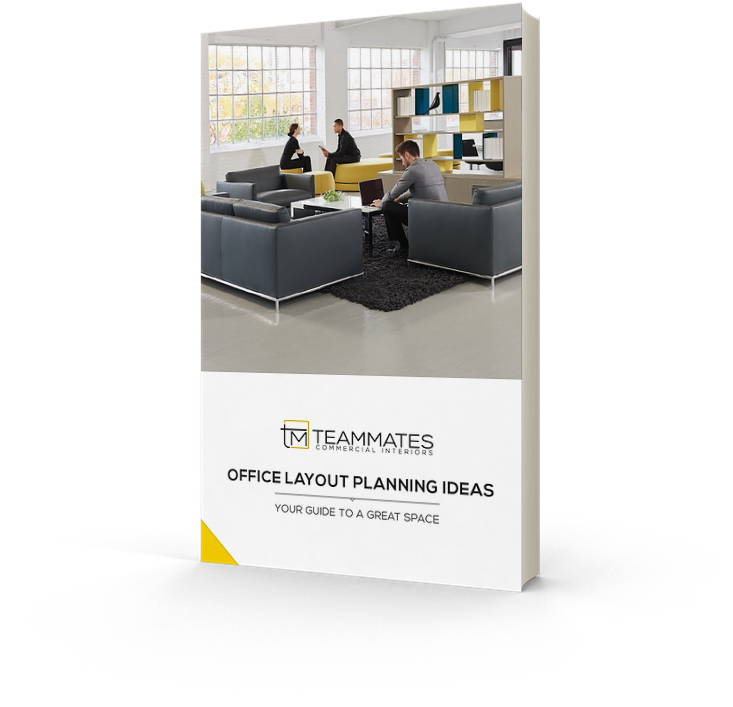 These office workstation layout ideas can help boost employee satisfaction and productivity. Height-adjustable desks, like Teknion’s desk, seamlessly adjusts between sitting and standing without interrupting workflow. 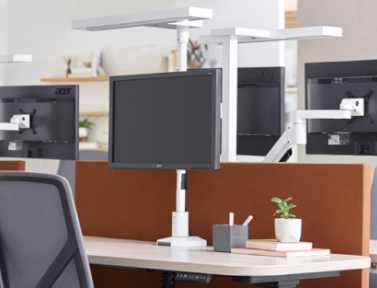 Consider complementing sit-stand desks with adjustable monitor stands or arms and ergonomically-minded chairs for your employees’ comfort. Divider panels and modular walls, like Teknion’s Leverage Panel System, create personal spaces out of open floorplans to balance collaboration with privacy for your workforce. Case goods style furniture collections, like JSI’s Swish Collection, pictured here, are ideal storage solutions for open office spaces to keep desktops clear and maximize workspace surface area. Modern workstation lighting solutions, like OFS’ “Tambient Lighting” is perfectly-adapted for open office environments while catering to each worker’s personal lighting preference. More specifically, the right kind of light. A Cornell University study found that access to natural light can increase alertness and another study found that the absence of natural light and outdoor views can leave your employees feeling tired and gloomy. So, it’s a no brainer to let natural daylight penetrate throughout your office space and illuminate your workstations wherever possible. Don’t have a lot of natural light to work with in your office space? No problem! We’ve got a few tips to help maximize what natural lighting you do have to work with or at least give the illusion of natural light in your office space. Don’t forget to position computer screens parallel to windows to reduce glare! Even with employees giving so much of their time, companies are facing an estimated $330 billion in lost productivity per year, according to the Gensler Institute. Now may be just the time to put these office workstation ideas in motion to inspire your employees to do their best work. For help bringing these office workstation layout ideas to life, book a tour of our showroom or contact us for a complimentary design consultation.